Why Is Heidi Heitkamp Enabling Donald Trump? Her party, the North Dakota Democratic–Nonpartisan League, has a rich history of opposing war hawks. She should have stuck with it instead of backing Pompeo. Even before Kentucky Senator Rand Paul announced his support for war hawk Mike Pompeo, whatever momentum might have developed for rejecting his nomination as secretary of state was thwarted when a Democrat, North Dakota Senator Heidi Heitkamp, announced that she would be voting for Pompeo. 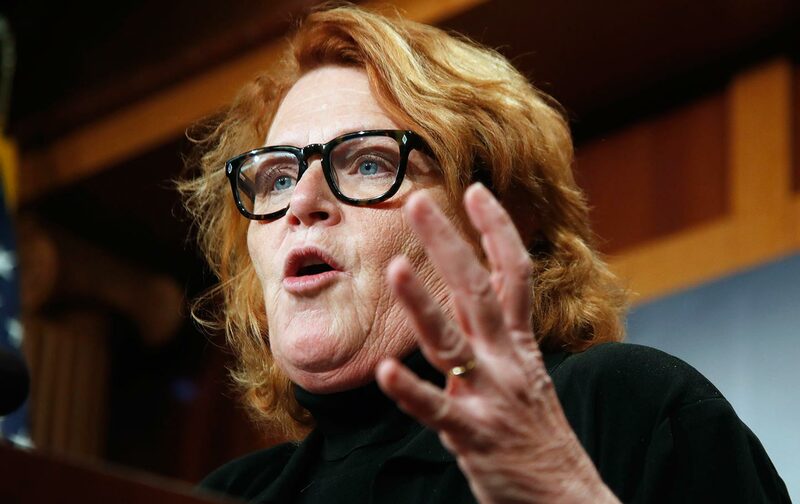 Heitkamp based her embrace of Trump’s noxious nominee on the absurd premise that the president is “entitled to his own cabinet”—an indefensible surrender to the White House that rejects the basic premises of congressional oversight in favor of an imperial presidency. Heitkamp’s decision cleared the way for other red-state Democrats who are up for reelection this year, most notably West Virginia Senator Joe Manchin, to endorse Pompeo’s selection. In taking the position that she did, and announcing it at such an early stage in the debate over Pompeo, Heitkamp broke faith not merely with the principled resistance to Trump and Trumpism but with the common-sense traditions of her own North Dakota Democratic–Nonpartisan League Party. Like the Minnesota Democratic–Farmer-Labor Party, the North Dakota Democratic–NPL Party was created decades ago through the merger of activists who were aligned with the national Democratic Party and supporters of a mid-20th-century progressive populist movement. In the aftermath of the war, North Dakota Senator Gerald Nye, who had roots in the Nonpartisan League movement, led a long investigation into war profiteering. And the skepticism about military interventions and military spending remained very much alive in the Democratic–NPL Party after the merger of the Democrats and the Nonpartisan League in the 1950s. Notably, Democratic–NPL Senator Quentin Burdick was a steady critic of the Vietnam War. He also cast a critical vote against authorizing President George H.W. Bush to go to war in Iraq in 1991—just as Democratic–NPL Senator Kent Conrad cast a courageous vote against authorizing George W. Bush to go to war in Iraq in 2002. On that fateful day in 2002, when so many Democrats got things so very wrong, Senator Conrad spoke the historic language of the North Dakota Democratic–Nonpartisan League and of the prairie populist tradition that had always been willing to check and balance the excesses of the executive branch—and that had been especially willing to do so on matters of war and peace. In supporting the nomination of an enthusiastic militarist like Pompeo, when even conservatives were questioning it, Senator Heitkamp spoke a different and disappointing language—that of the Washington insiders who can always find an excuse for tossing aside the Constitution in their rush to empower new presidents to wage new wars.